We write to you as different grades of health practitioners from different specialities, to express our concern about the health & social care bill and NHS reforms in England. We would like you to take account of the inevitable damage these will cause to the health and wealth of the nation and we would ask that you withdraw the Bill as well as taking steps to ensure that the damaging effects of reforms are reversed with immediate effect. Whilst GPs and other clinicians support the concept of clinically-led commissioning, we do not believe that this expensive upheaval of the health service will even deliver that. If you really want to put clinicians in control you should listen to what they are saying, and put this increasingly confused legislation out of its misery. 1. 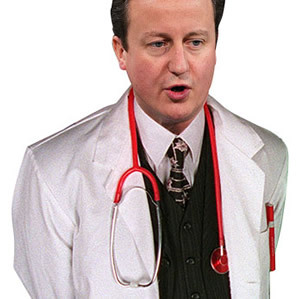 Reform of the NHS is necessary, but that it should have been evolutionary and not revolutionary. The very real problems of the system would be compounded not resolved by the type of change which the passage of this health and social care bill would deliver. 2. The claimed financial imperatives in seeking reform to health services were illusory. Added to them now are the considerable costs of winding down PCTs and SHAs, and setting up parallel structures, as well as the cost of redundancies and in some cases re-employment of senior health professionals. The growing waiting lists and cancellations of clinics and operations have added to financial and health burdens for the state. The PCTs are being shut down, and now it transpires from leaked Department of Health documentation that their work will in future be carried out by private sector commissioning support organisations, doubtless at considerably higher cost to the tax payer. 3. The facts speak for themselves; the BMA, the Royal College of GPs, the Royal College of Nursing, The Royal College of Midwives and the Chartered Society of Physiotherapists have also asked for the bill to be withdrawn. The editors of the HSJ, the Nursing Times, and the BMJ have called the reforms an ‘unholy mess’. An editorial in the Lancet said simply ‘It’s time to kill the bill’. The Royal College of Psychiatrists states that the bill is fundamentally flawed, while the Royal College of Radiology are opposed to the Bill in its current form. Sarah Wollaston, Conservative MP for Totnes, said that the reforms could destroy the NHS. Sir David Nicholson, whose responsibility it will be to oversee the bill’s implementation, has expressed the view that the reforms are on such a large scale that “they could be seen from space”. A cross-party health select committee led by Conservative MP Stephen Dorrell states that the health reforms have already caused disruption, distraction, a cut in patient services and a move away from innovation and greater efficiency even before their main thrust is launched by the passage of the bill. 4. The bill was complex enough at the start of the launch, but several hundred amendments later it has become even more so. None of the amendments agreed by the government do anything to resolve the fundamental problems with the bill which will see costs rise further and service coordination disintegrate. 5. The bill will enhance competition on the basis of cost and not quality, it will pit the different parts of what should be a coordinated system against one another, and it will lead to fragmentation of the NHS within England. 6. The bill seeks to complete the roll-out of market-based changes to the NHS which has already added 14 per cent of market-related deadweight costs to the system despite its limited scale up until now. Not only will the passage of the bill make it much more likely in the future for hospitals to run into financial difficulties, but the bill, extraordinarily, specifically sets up a regime to facilitate their insolvency and closure. Many of the more complex and chronically ill patients will find that the new competition-based health service will not support the coordination of tailored care packages as the existing system does, leaving them vulnerable to not getting access to high quality care. 7. Your government is taking privatisation of the NHS to a different level than any previous government by enshrining this in the bill. We are concerned about your proposals aimed at completing the roll-out of the ‘any qualified provider’ concept which will see costs climb uncontrollably at the cost of quality of care, and that commissioning of health care is to be compulsorily shifted into commercial “commissioning support organisations” attracting organisations that have a track record of fraud against the US government. The removal of a cap on private income for foundation trusts is bound to result in a two-tier system even within those NHS hospitals which are able to survive under the new regime. 8. The reluctance of the secretary of state for health to accept the responsibility he has towards the NHS post-reform makes his position untenable. It would appear that the reason for clause 1 is to weaken the link between the government and the actual functioning of the post-2012 system to avoid the possibility of successful legal action against the government. If this bill is passed we expect that there will be a call for judicial review of the change. We would respectfully ask that you reflect on these matters and take appropriate steps to engage with those like us who have a genuine desire to improve the quality of care for our patients without jeopardising what has been inherently good about the National Health Service. The full list of signatories can be found on the letter, available here.